1. Combine the wine and honey in a large shallow dish and stir in the rosemary. Add the prepared fruit, mix well and leave to stand, covered, in the fridge for 1–2 hours. 2. Using a slotted spoon, remove the fruit and rosemary from the juices and set aside. Stir the lemon juice into the marinade and reserve. 3. Whisk the cream in a bowl until it forms soft peaks. Gradually whisk in the reserved marinating juices until the cream is once again thick and peaking. Spoon into 6 serving glasses and chill. 4. Preheat the barbecue, griddle or grill to high. 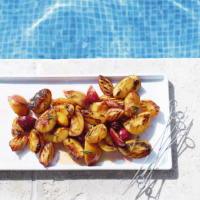 Thread the fruit onto skewers and cook, turning occasionally, for 2–3 minutes, or until grill-marked and piping hot. Serve with the syllabub and biscuits.